BIG SALE!! 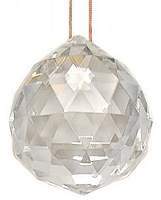 CRYSTAL FACET BALLS BIG SALE!! In 2 Sizes 2"- 2 1/2"
Value priced clear Crystal Prism Ball with filament attached and ready to hang by any window in your home. 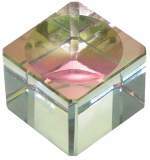 Feng Shui masters recommend hanging crystal prisms in the bedroom and the home as a potent Feng Shui love cure. Crystal prisms radiate and increase the precious Yang Chi Energy which is so important for love and romance! Exquisite beveled clear crystal display stands are perfect marble holders or marble display stands, suitable for 5mm or larger marbles. These specially priced small Crystal Stands are 25mm or 1" square by 15mm or 0.6" H with beveled corners and sides. The concave dip top accommodates marbles, small spheres and eggs, pearls or any small curved collectible with class. These stands can hold 5mm - 50mm or 1/4" - 2" W marbles, spheres or eggs. Exquisite beveled clear crystal display stands are perfect for small spheres and eggs. These specially priced small Crystal Stands are 30mm or 1.2" square with beveled corners and sides. Now available while supplies last. and small spheres or eggs. 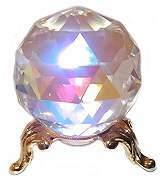 Stunning Crystal Aurora Borealis (rainbow) crystal ball and egg display stand. These square crystal bases are 1 1/8" to 2" wide and have beveled corners. The concave top accommodates crystal balls, eggs, marbles, globes and paperweights with class. For 3/4" - 3 1/2" marbles, spheres or eggs. Decorative tapered crystal display base with deep center dip will safely hold 5mm and larger marbles, eggs and more. Show off your unique marbles, small spheres and eggs, pearls or any small curved treasure with elegance. Sleek and tapered, optically pure crystal display base in 4 sizes, from 55mm or 2 1/4" to 110mm or 4 1/4" square with height variations listed. 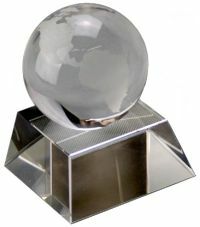 The concave scooped top holds crystal balls, eggs, awards, globes and paperweights with class. The globe is sold separately. Clear square crystal sphere and egg display stands in 4 sizes, from 40mm or 1 1/2" to 50mm or 2" square with beveled corners, the heights vary and are listed below. The concave top holds crystal balls, eggs, marbles, globes and paperweights with class. These stands can hold 30mm - 120mm marbles, spheres or eggs. Helpful guideline: The stand width should be between 1/3 to 2/3 the diameter of the sphere. Lucite has the luxurious appearance of crystal yet is light and unbreakable. These Lucite Stands have a semi circular indentation to hold eggs, spheres or paperweights and a classic beveled edge. Add light and variety to your favorite collection with these affordable stands! 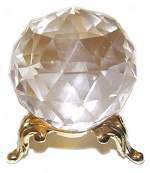 Lovely Czech Crystal round fluted stand holds a 30- 75mm or 1 - 3" crystal ball, marble or egg. An elegant and simple accessory for your precious crystal collection. 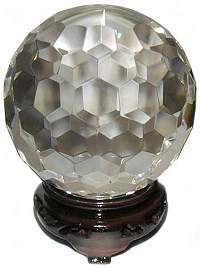 High quality Czech Crystal Aurora Borealis round fluted stand holds a 30- 75mm or 1 - 3" crystal ball, marble or egg. An elegant and simple accessory for your precious crystal collection. 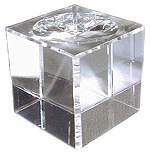 Stunning clear Crystal Cube sphere and egg display stands are 2" square with beveled corners. The concave top accommodates crystal balls, eggs, globes and paperweights with class. Crystal stands are a perfect match with Quartz, Citrine, Fluorite, Obsidian, Girasol Opal and many other gem spheres. These stands hold 30mm - 150mm marbles, spheres or eggs. Also available in rainbow Aurora Borealis Finish.